Whyte’s first aluminium trail 29er hardtail, the 829, was so well received when it launched last year that it’s no surprise that the UK firm has upped its offering for next year with a range of four new bikes. Whyte bikes are designed and tested in the UK and their geometry differs from most of the US imports flooding local bike shops – they’re definitely designed for longer rides on more technical terrain, and feature slacker head angles than the more racy US offerings. The range starts at £749 for the 529, rising to £999 for the 629, £1,499 for the 729 and tops out at £1,999 for the 929. Each bike in the new line-up features a smartly designed 6061 triple butted aluminium frame with hydrofromed curved downtube and seat tube and each is well equipped for its price. There are differences in the range, however. The 529, 629 and 729 are all fitted with 100mm suspension forks to give a 68.5 degree head angle, while the curved seat tube allows for 440mm chainstays on each of the three frame sizes. The 929 however gets a 120mm travel Fox CTD fork and combined with the Adjustable Modular Dropouts (carried over from the 829) the head angle can be tweaked from 67.7 to 68.3 degrees, a 0.6 degree range of adjustment that also changes the chainstay length from 425mm to 445mm. The 929 is well equipped with a Shimano XT groupset and brakes, Fox 32 CTD FIT Performance fork, Hope hubs, WTB rims and Maxxis Ardent and Ikon tyres. Claimed weight is 11.3kg. Whyte was one of the first to offer a 1×10 drivetrain as standard on its 146, and the 929 is one of the few 29er hardtails to come pre-fitted with a single ring setup. With the E-13 TRS press-fit 30 chainset and direct mount top chainguide, going 1×10 has never been easier. A 32 tooth chainring is fitted which, with the 11-36t cassette, should get you up most hills. There’s ISCG05 tabs on the bottom bracket shell as well. Differences aside, the four bikes have tapered head tubes for improved stiffness, and continuous outer cable routing and Crud Catcher mounts to provide winter weather protection. With 70-80mm stems and 700mm handlebars fitted as standard the bikes are well poised for action. The 529, 629 and 729 use Whyte’s new XC-29 in-house designed wheelsets with 32 spokes and their own design hubs with sealed bearings. 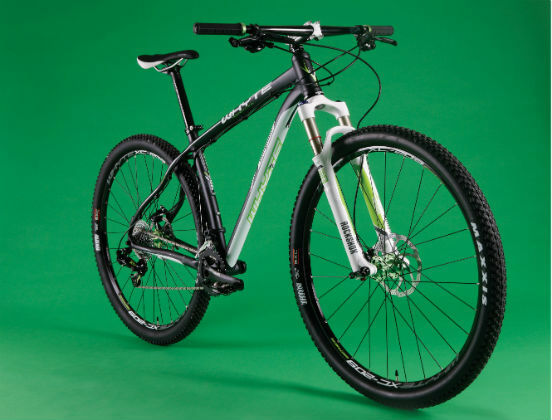 Squarely aimed at trail riders looking for a versatile do-everything hardtail there are few 29ers that look as trail capable as Whyte’s offering. For more 29er hardtails, check out our reviews of the Scott Scale 29 Comp and Charge Cooker Hi.